Club Penguin Cheats by Mimo777 Club Penguin Cheats by Mimo777: Club Penguin Coins for Cash!? Wow, this seems like a pretty cool idea, except it costs $16.99! That seems a little pricey to me! Hopefully the price will drop before too long. That's stupid. It costs way too much. 2500 is so easy if you just play cart surfer (or whatever its called) a few times, i can't believe they make them so expensive, besides, only members can actually use them on catalog stuff. Good thing I have $121! thats kinda a rip off cause its paying real money for online money and thats not even alot of coins! you can get 4500 just playing aqua grabber for like 10 minutes! yup it sure does! cp is ripping us off... im sad now. i think it should be only like 8$ or something. Its isn't that great of an idea because i could get that many coins in a day without paying good money. It would be dollars wouldn't it! Honestly, I think it's not CP's best idea.2500 coins you can easily get in a day.I got around 480,000 coins, so I don't need more lol. gee i can earn those coins for free! I dont need to pay as much as a few month membership to earn 2,000 coins. Besides i earned 5,000 today by playing dance contest! I'd rather eat pudding and play Dance-thingy! They got greedy before club penguin got bought by disney membership for 1 month was like 3 dollars. They keep trying to make real cash out of CP coins. Thats expensive, I could earn that amount of coins in 10 minutes! I think that is a really silly price. hey, if you have the gaurd dog costume on from the play at the stage and you sit, you turn to stone! its cool. try it!! Thats a very lame idea-it just my opinion, not saying its true, but thats way too expensive. I have earned 55,991 coins in Club Penguin since 1101 days (the day I played) and I never cheat and get coins like some penguins-thats stupid. I mean its really easy to get coins, 2500 would take me 15 minutes, maybe less. I would NEVER spend that much money on 2500 coins-they should reduce it to $2/10,000 coins or something. Or else, no one will buy it. P.S. The reason I have 55,000+ coins is because I am a really old player and I have never been a member-I don't see it worth enough, its just a game-so anyway, I play a LOT of games and I never cheat. Also Mimo, I can get 5000 coins in an hour of I concentrate, or about 10,000 in 2 hours. How much can you commenters get? :O.
thats little coins high price. That's not right. I already have $1,000,000. I don't need that. I play Puffle Round-up and get 100 coins per round. Where can you buy these cards? I think this is fake news as these cards were included with EPF. wow. Seriously? That's so stupid. It's so easy to earn coins, and it's so expensive! that is so stupid that people would actually waste money on a virtual game it doesnt help you in any way yet you are wasting your real money on fake money!!!! spend that on something you can enjoy like the new club penguin nintendo DS game. What?! You could get almost Three Months Membership with that much money! And what are you going to buy with 2500 coins? a surfboard and a divers suit? I mean come on people! Buy something you can really use in real life like a sled or a used pair of skis! omg mimo! i was just like what should i do with my money and i have 30 something dallors and im buying that! thats about 10 minutes per game. Umm why waste the money on coins when u can play a game ur really good at and get more than 2500 coins. Then $1 is only 147.15 coins! Cool idea though I guess..
i could earn that in half a hour. its expensive but its easier than playing games to get that many coins! Just master aqua grabber. Thats what I did. I can get 1000 coins in like two minutes. Just answer questions or help somebody out. I have $121! But yeah totally getting that, cuz I have tons of coins! It actually working with any game, but I wished CP wouldn't have fixed that! I could just play puffle roundup and get that many coins! I have over 40,000! That's not even that many coins for club penguin. =/ That's not even enough for most of the igloos. Mimo how do you put money and coins from toys on CP? This isn't the smartest idea CP has offered to people. This is rediculous! It is way to much money for people to spend on a very small amout of coins. Play aqua grabber a few times, or play cart surfer 5 or 6 times. It would take you less than 10 minutes. I would buy it if it was like $3, but $17 is way too much! My opinion: Don't buy it. This wastes your gas and your money! This is expensive! Just play aqua grabber or cart surfer a few times and you will get more than 2,500 coins in less than 10 minutes. I mean seriously people, don't waste your money! True, but I'm sure the prices will be lowered soon enough and it won't cost as much. :) Perhaps they are still adjusting the prices. I think maybe a little more (I was thinkimng 5 or 7). Perhaps Clubpenguin could do an allowance where you pary 17 dollars in advance and every month for the next 6 or 12 months (which ever they'd want) you'd get 2,500 coins the first day of the month. That would be cool, right? wow that is a little too expensive. YOu can play a few gae for like 10 minutes and get that many coins for free. 17 dollars is WAY too much for that! Oh and also i found a glitch that is kinda cool. Put ur box portal in your room. Get really far away from it. Walk to it. While u are walking, click edit. Stay there. U will arrive in box demension. No penguin names are there. That is cool. kinda. Also sadly it doesnt show talking either so it is pretty confusing but fun to do. Also i used a glitch about a year ago and i got 400,000 coins so i still have like 338,245 or something like that. But most ppl dont have that much money and that is a rip off. Why rip us off dude? WOAH!! That is so much money for just that if you had to pay that much money then make it like 15 thousand or something I could earn that much in like 10 minuteS!! What can non-members even spend it on? I had nothing to spend my 40,000 coins on so I donated 25,000 to Coins for Change..
only 2500 for 16$!!! Overpriced much XD? Still, way too much for ONLY 2500.
that's dumb. I can get 3000 coins in about 15 minutes without having to pay a cent. I can get a lot of money. Maybe like about 10,000 coins if i really try. I dont really play games that much because i still have like 400,000 coins from coffee bean glitch. I personally like to play dance contest though. Pizzatron is really good to get cash. Cart surfer is easy. Dance contest is fun. Puffle round up is really quick and easy! In puffle roundup if u get all ten pufles in, the ammount of time u have left is the ammount of coins u get. It only takes like ten seconds to play it so in 5 minutes u can get a good thousand coins. I hope this answered ur question and helped u with a few tips. PUffle round up you get TONZ OF COINS in, within a short amount of time. That's why i find this coin thing such a rip off. Here's how I think of it. Clubpenguin is making some stupid money thing for the LAZY ONES WHO DON'T WANT TO WORK A BIT TO GET A TINY BIT OF MONEY. lol. To be a mod, answer a question by a penguin and put (CPG MOD) after your name when you answer it. Thanks? But you can just download clubpenguin moneymaker! Yeah, I know, its unnescesary for nons cause they can barely buy anything! Yeah, I know, CP is giveing out rip offs! It should only be like five bucks or something. Keep in mind cp, that WE'RE paying YOU REAL MONEY for online money. Its not worth it. I agree a very good idea! But, as everyone is saying, it costs too much! what!? you can earn it in 25 minutes instead of buying it! It's not club penguin anymore! It's club SCAMguin! I could get that money in 10 minutes playing puffle roundup plus i have too much money. This is a ripoff for 2500 coins its not a lot. It cant buy you a lot of stuff. Things in the catalogs are like usually 600 or more coins. Lol i can get 2500 coins in like a half hour, or probably less! even though it is expensive you can get a lot of stuff! But heres a tip to none members. If you are going to get that card get a membership aswell or other wise you will have coins for no reason. Okay nearly every comment i have read in the last few seconds is blaming cp! People they had an idea so they brought it to us and besides that some experienced people might not want to bother using the minigames because they find it too boring because they have seen it too many times! Also cp might have made that for new people who aren't good at the games yet as a starter pack or it might be like a gift card so that on your birthday you can buy an item you've always wanted without having to bother to play a minigame! Gah, they should only be $5. but 16 dollars for 2500 coins? I could make that much in no time playing cart surfer and ouffle roundup. Only 2,500 coins for about 17 dollars? That's a humongous rip-off and you can play games to earn coins. I will not be getting this! True, but monkey maker and trainer are both illeagle and could get your penguin banned. They violate the terms of agreement you and/or your parent agreed to when you signed up for clubpenguin. Who would ever buy that!? I could get 2500 coins in 5 games of Cart Surfer! $16.99...rip off. 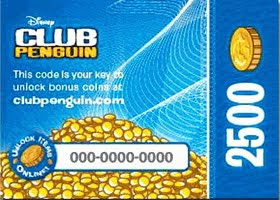 You do have to admit it would be a cool birthday present to get coins on clubpenguin. I was thinking why not make a monthly allowance for Member. If you have a 1 month membership, 500 coins per month. 6 month membership, 1500 coins per month, and finally a 12 month membership, 2500 coins per month. Cool? Yes but this most likely violates the terms of agreements you agreed with when you signed up for clubpenguin, and using this could get your penguin banned. As a CPG MOD You should not be encouraging the use of hack programs. as a CPG Mod you are supposed to be repersenting Mimo and everything he stands for (which includes him not liking hack programs on clubepnguin) You can use it to your discression, but I do not recomend encouraging others to use it, especially on Clubpenguingang. AMEN BROTHER! AMEN! i agree completely. Clubpenguin should be free, but the problem is without people having to pay for memberships, the only form of income would be for clubpenguin to (Im assuming) put up advertisements on there site, maybe even in the game. Although it'ss unfair not everyone can be equal on clubpenguin, It's the only way to keep the site up and running. WAYYYYY Too much money! And 2500 coins? I could get that easily! A few games of Cart surfer or catchin waves! Wow, I could get that money in a few mins, I would only pay five dollars. Don't use it! Seriously! cp will find it and ban whoever used it! Well work really really really hard! Good Luck! I can get 20,000 if i really try. Well guys i agree with some bits but without membership and toys we wouldn't have the brilliant club penguin we all love and it will most probably go out of business and we won't have club penguin at all. So we can't blame club penguin for making something a little bit over priced. there membership is expensive enough! Y20said... also mimo i can get 5000 in and hour and 10,000 in two hours how many coins can you commenters get?:O. aqua grabber like 1260 or 1250 i forget but 5000! which game Y20 which game! warped and waddling! mimo this has nothing to do with comment but go back to orange!!!!!!!! First, you buy a CP toy. There will be a code on it. Next, you start CP. After you hit play now, you will see an icon that says Unlock Items Online. you click that and log in and two options appear. Click on whether you have a book or a code (toy). Then, just input the code! bad idea! u shud just earn coins. y waste money. Please, be careful. As far as I'm aware, this is a hack (or 3rd Party System) and Club Penguin are strictly against this. You can be banned for certain periods of time, or, if you carry on, your penguin will receive a permanent ban! i find that a rip off why would they charge so much money for something worth at least 5 cents in real money plus we could always earn the coins ourselves. Thats right, fellow earthling. i think the price should be about $5. I could earn more in 5 minutes..
Well You dont need to buy that you can use penguin storm to get up to 100000 coins at once and the best of all is that penguin storm is free!!! I could just buy two packs of action figures and unlock four items and get 3000 coins with that amount! such a rip off... why are they even selling them? No one will buy them! I mainly meant the comment for Anonymous. But you were right I was just adding things to it. Penguin Storm is cheating! take my advice get rid of it fast! Club Penguin will find it and they will ban you! But what about if you don't want the toys! your wasting your money and house space for nothing! why not just play games instead of buying them! i think it would be a good idea if they were $5 at the MAX! wow such a rip off!!!! u can get over 10,000 coins just playing puffle round up for like 15 mins!!!! Ok, that is too expensive, and I have some advice: don't buy it! I agree with Boospengi completley. Besides that you can hack the game and don't get caught. Not giving away any hacks. CP is charging way too much, just for 2500 coins! They should increase the coins given, and lower the price. I doubt many people will buy it, only ones who are to lazy to play a couple of games to earn the money.